I absolutely love everything about The Vintage Cosmetic Company's packaging. It's girly, floral and just oh so pretty. And, luckily, their products are as good as they look, too. They recently sent me their slanted tweezers to try and I've been loving them. 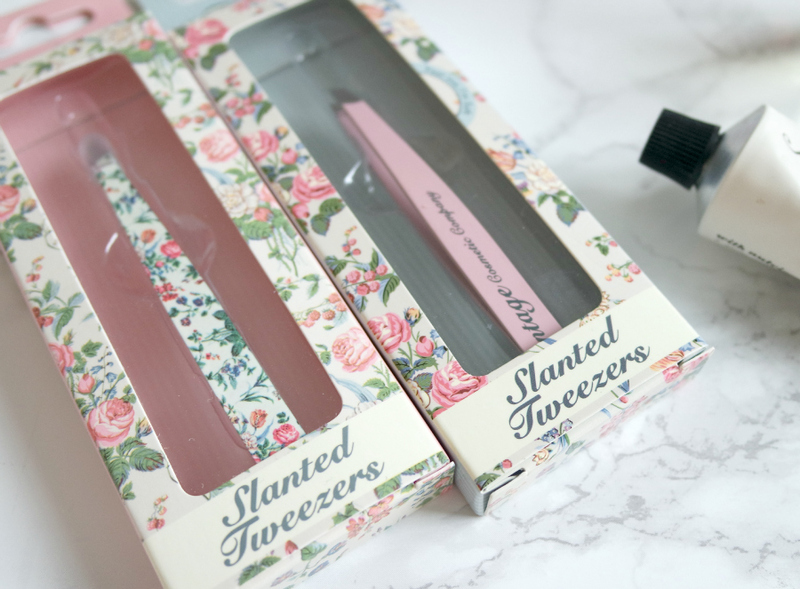 Tweezers are a bit of a boring, everyday item but throw a cute floral design on them and they suddenly look a lot more appealing! I often find some tweezers can be a bit slack (is that the right word?) and lose their grip really easily but these grab stray hairs easily and efficiently. The floral ones are my fave but the pink pair is still a lot easier on the eye than your standard silver ones. Pestle & Mortar Pure Hyaluronic Serum* When this badboy dropped on my doorstep, I was a little confused as to what it actually was. The name 'Hyaluronic Serum' might sound a bit scientific and the packaging doesn't give much away but it's basically an all-in-one serum. And, all I know is that, this serum has worked wonders on my skin, over the past few weeks. I use a few drops all over my face before applying my moisturiser, on a night, and, despite being extremely lightweight in texture, it's really helped to keep my skin hydrated as the colder weather has started to set in. Okay, so, this purchase doesn't exactly scream 'Autumn' as it's actually the summer edition of the Marc Jacobs Daisy range. However, I ran out of Daisy Eau So Fresh and just wasn't feeling spending £50 on a replacement bottle. I noticed Boots were selling Sorbet for just £34 for a 50ml bottle which I thought was pretty reasonable. Sorbet is a little sweeter than the standard Daisy scent and, yes, it does smell a little summery but it's still a gorgeous scent and definitely worth the discounted price! I've been spritzing myself in this everyday and I love it - plus the pink and purple bottle adds a little bit of girly colour to my dressing table. The Body Shop Frosted Plum Shower Gel* Now this is definitely a much more seasonal purchase - say hello to the Body Shop's frosted plum range. I always love the Body Shop Christmas ranges and this one definitely doesn't disappoint. I've been using the shower gel daily for the past couple of weeks and will most likely be repurchasing when it runs out as I'm obsessed with the smell. It's a really warming, rich plum scent that just smells Christmassy, somehow. Don't ask... It just does. 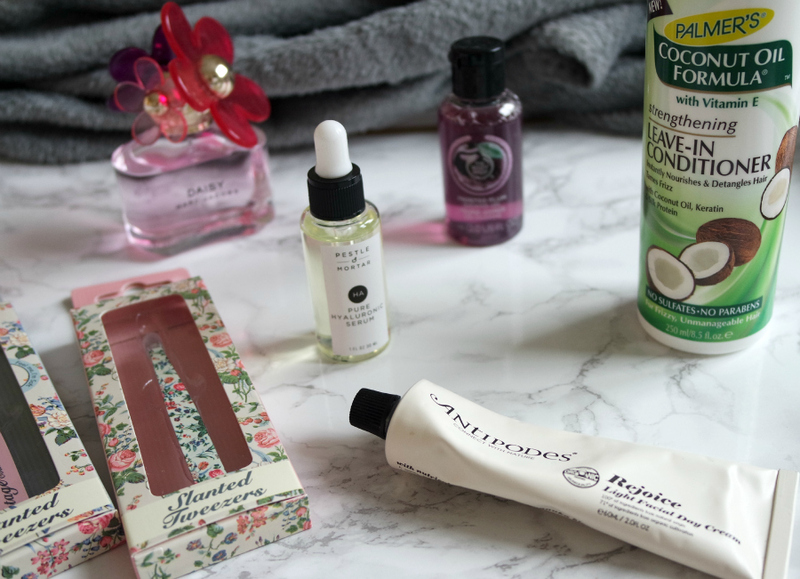 Antipodes Rejoice Light Facial Cream* I did a more in depth review here of this moisturiser a couple of months ago but I just had to include it again as it's proving to be one of my favourite day creams. I love how it's not really scented and, although it's just a simple, no frills day cream, it keeps my skin moisturised and hydrated all day and doesn't cause me any breakouts - which is exactly what I want from an everyday moisturiser. Palmers Coconut Oil Strengthening Leave In Conditioner My hair is ridiculously knotty after washing so a leave in conditioner is a must for me. I needed to spend a little bit more on Feel Unique, a couple of weeks ago, to qualify for a discount code so just randomly added this to my basket as anything that smells of coconut is always a winner in my eyes. Anyway, I LOVE THIS. It's definitely the best leave in conditioner I've used. It smells gorgeous and it just works really, really well. 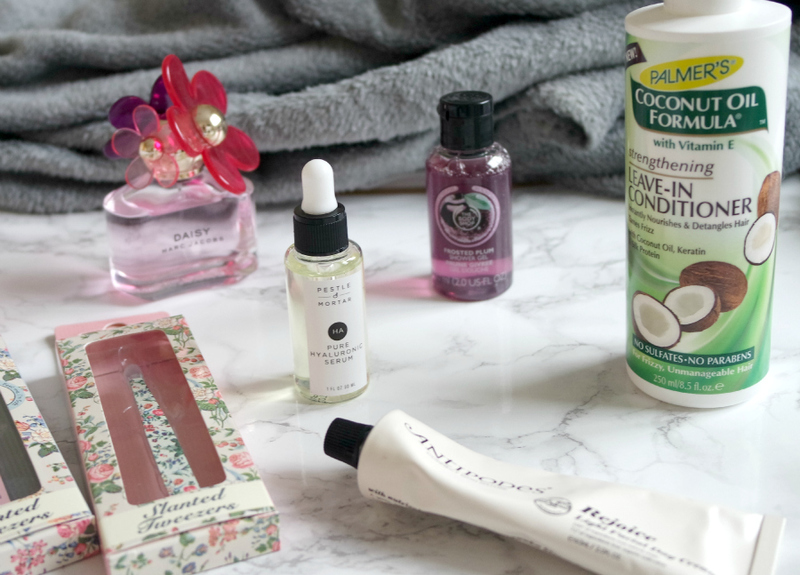 I only need to spritz a little bit through my hair to really get rid of any knots and it makes my hair smell and feel beauts - what's not to love? S H O P T H E P O S T . . .
What beauty bits have you been loving recently? Check out my November advertiser - Sam from Stories Of Sam! Find out how to advertise with me here.